CART Fury offers players an intense racing experience, combining ultra-competitive, wheel-to-wheel CART racing with vividly detailed fantasy elements. The result is a wildly entertaining racing experience unlike any other coin-op driving game. "CART Fury is a truly unique, highly entertaining racing game," said Helene Sheeler, Vice President of Marketing for Midway Games West. "The design team took the wheel-to-wheel, intense action of a CART race and added the trademark Midway style of adrenaline-fueled competition that breaks the rules of physics and gravity." CART Fury utilizes advanced graphics and animation technology to create gameplay elements never before included in a racing game. Everything from the cars and tracks to the backgrounds and scenery are presented in vivid detail. Wheel-to-wheel racing means contact, and the vehicles in CART Fury withstand and show major damage. Players can actually watch their cars "heal" over time, gradually repairing damage to the tires. After enough collisions, cars will first shed parts, with the debris and shrapnel becoming physical elements in the race. Cars that suffer too much damage will eventually break apart, tumble through the air and explode. 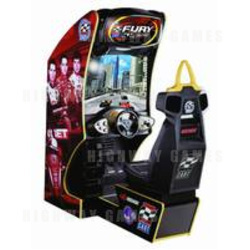 In addition to the advanced graphics and animation technology, CART Fury utilizes advanced hardware and game cabinet technology to fully immerse players in the action. A four speaker sound system with a subwoofer in the seat surrounds the player with the sounds from the race, including advice from a crew chief and commentary from Danny Sullivan, 1988 CART series champion and legendary 1985 Indy 500 "spin-and-win" champion. Each cabinet also features an active-feedback steering system, a racing seat with roll bar and dashboard with a fully functional LED display to complete the authentic CART racing experience. CART drivers featured in the game include instantly recognizable names like Michael Andretti, Christian Fittipaldi, Jimmy Vasser and Juan Montoya, the 1999 CART season champion. Players can choose to race as any of the 10 CART drivers in their sponsored vehicles, or use a button combination to select one of the three hidden cars: a dragster, 60s roadster or Jet-powered futuristic car. There are 12 selectable tracks to race on; 8 are highly detailed re-creations of CART courses from around the world, and the other 4 are wild fantasy courses. The fantasy courses range from a night race through the streets of Frankfurt, Germany to a race in and around a highway construction zone. All 12 tracks have shortcuts and jumps to add to the challenge and strategy. "Getting to know the specific details of each track – the tight turns, straight-aways, shortcuts and jumps - is a key strategic advantage," said Sheeler. There are also "boost" buttons on the steering wheel that will give players extra power. Boost is limited, however, so players need to decide the best times in each race to use the extra speed. "Superboost" is awarded to players that achieve fast lap times. The game also features a variety of hidden codes that will unlock secret driver, weather and competitive features including "big head", "fog", and "instant wreck". For more details and pictures of Cart Fury, please follow this link.